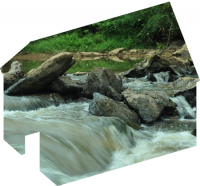 An open session to learn about arts + environment project funding opportunities at UGA. 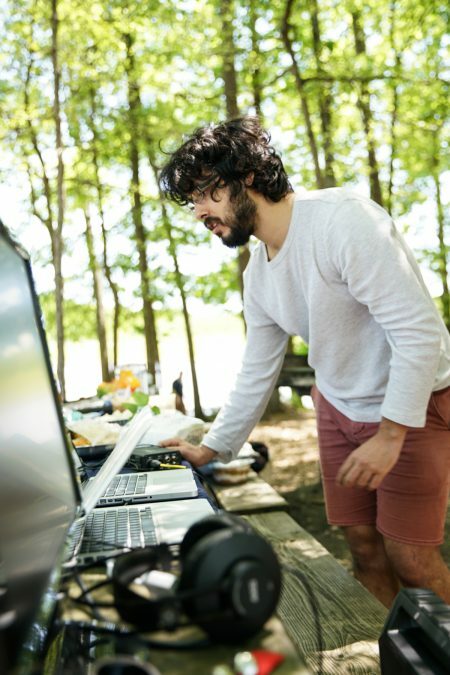 Representatives from the Office of Sustainability, Social Ecology Studio, and Ideas for Creative Exploration will be available to answer questions about Campus Sustainability Grants, Social Ecology Studio Grants, and Idea Lab Mini Grants. Get feedback on project ideas, meet potential collaborators, proposal writing advice, and learn more about available resources. Lead applicant must be UGA student. Collaborative teams may include students, faculty, staff, and members of the community. Deadline for grant proposals is Monday, November 5 at 5 PM. 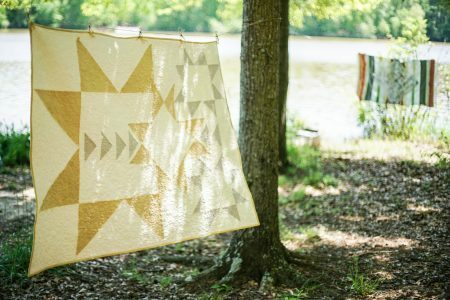 The Idea Lab Mini Grant Program is supported by Ideas for Creative Exploration. 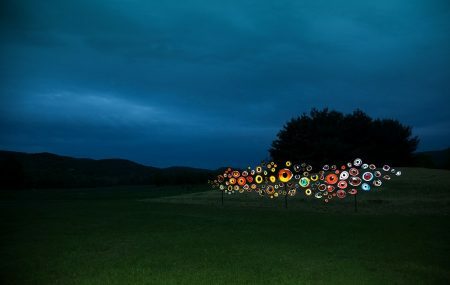 The 2018 theme, Arts Environments: Design, Resilience, and Sustainability, is an invitation to explore the relationship between creativity and diverse cultural locations, by framing discussions about design, resilience, and sustainability in context of interdisciplinary artistic and environmental practice. The theme offers an opportunity to think broadly about the ecology of the arts and their environments, in terms of performance, design, and engineering. A land and sea grant institution inextricable from the town of Athens and the broader ecologies of Georgia and the Southeast, the University of Georgia will provide a rich context for thinking creatively about Arts Environments globally. Students who are interested in volunteering during the conference should contact Mark Callahan, mark.callahan@uga.edu. All student volunteers who satisfy volunteer requirements will have free access to conference events. 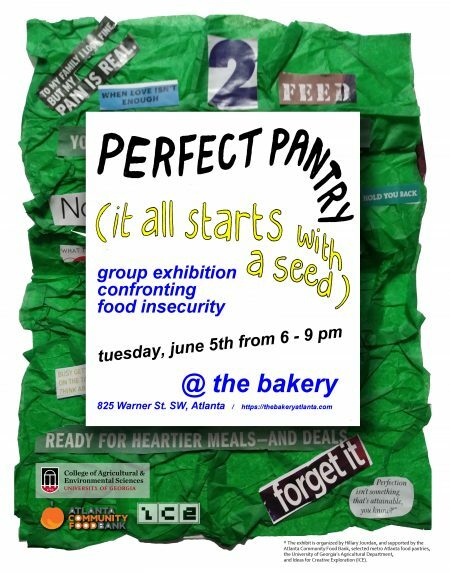 Perfect Pantry (it all starts with a seed) is a group exhibition consisting of collages, journals, interactive work, and spoken word by those who face food insecurity in metro Atlanta. The exhibition Perfect Pantry (it all starts with a seed) is an emotional and interactive look into the lives of those experiencing food insecurity in metro Atlanta. In partnership with the Department of Agricultural Leadership, Education & Communication at the University of Georgia in Athens, the Atlanta Community Food bank and select metro Atlanta food pantries, this project uses small art pieces created by food pantry clients as the platform for food insecure individuals to share their experiences and critiques of food assistance, in the hopes of bringing change to make Atlanta food assistance models more effective. Organized by Hillary Jourdan with support from the Atlanta Community Food Bank, selected metro Atlanta food pantries, the Department of Agricultural Leadership, Education & Communication, and Ideas for Creative Exploration, an interdisciplinary initiative for advanced research in the arts. 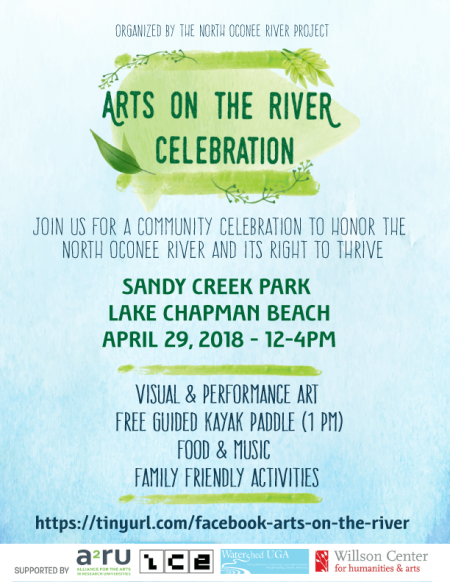 Join us for a community celebration of visual and performance art to honor the North Oconee River and its right to thrive and be healthy. 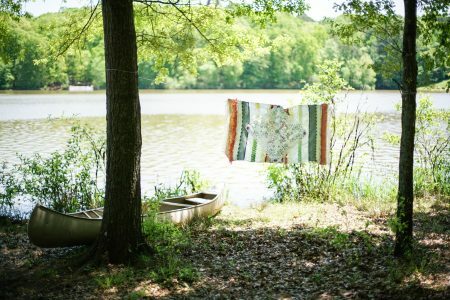 This event is a one-day art exhibition with dance, spoken word, and music unfolding on the river and its banks. 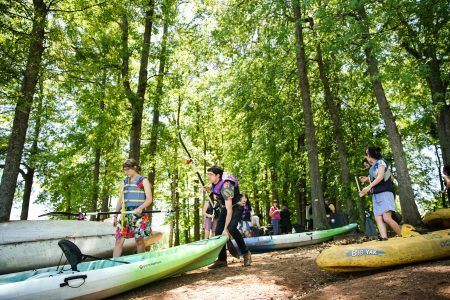 Visitors will kayak in the water and experience the art. 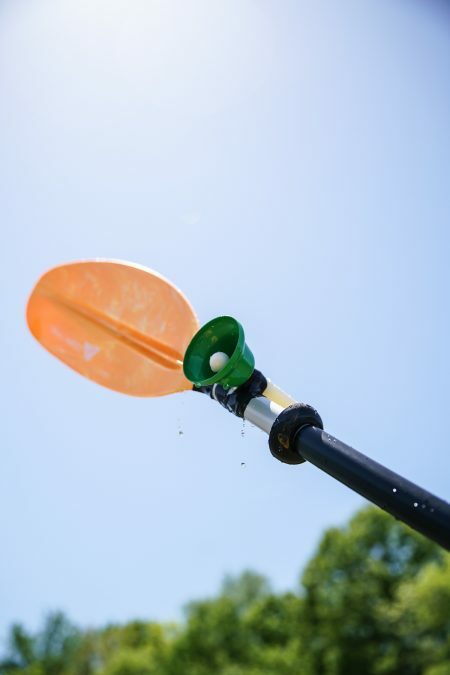 Registration for kayaks at 1 PM (limited availability). 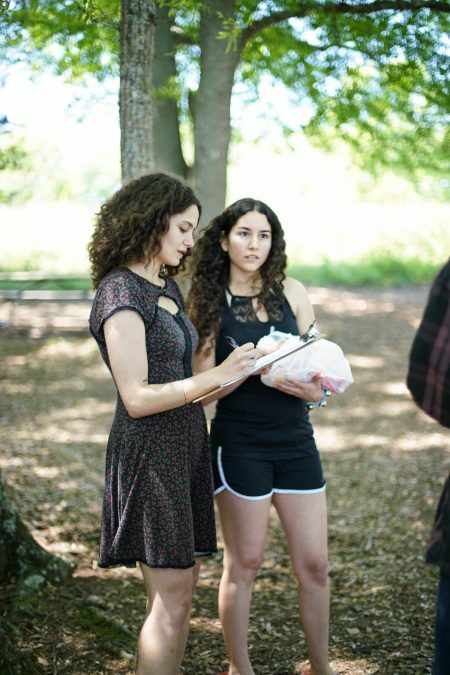 This project is made possible by the support of the Alliance for the Arts in Research Universities (a2ru), Ideas for Creative Exploration, Watershed UGA, and the Willson Center for Humanities and Arts at the University of Georgia. Free and family friendly.